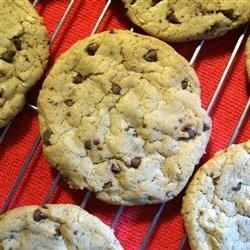 "This is the best Peanut Butter Chocolate Chip Cookie I have ever had. I researched different cookies two years before I found this one. It is chewy, plump, and delicious." In a large bowl, cream together the butter, brown sugar, white sugar, salt and peanut butter. Beat in the eggs and vanilla. Combine the flour and baking soda; stir into the batter to form a dough. Mix in the chocolate chips and walnuts. Scoop mounds of dough as large as two tablespoons onto the prepared cookie sheets. Cookies should be at least 2 inches apart. If batter is crumbly, roll portions of dough into rough spheres between the palms of your hands. Flatten cookies down by 1/3 using the bottom of a glass. Bake for 10 to 12 minutes in the preheated oven, until well risen and brown. Do not overbake they will firm up a little as they cool. Allow cookies to cool on baking sheet for 5 minutes before removing to a wire rack to cool completely. Very good cookies! If you want more peanut butter taste instead of chocolate chips I just put in peanut butter chips. They are wonderful! These cookies are awesome! I increased the peanut butter and vanilla as suggested by another person on here. MMmmm!!! Just got these out of the oven and they are delicious! The recipe is good as is, but if you want a little more peanut butter flavor maybe go for a full cup instead of 2/3c. These are awesome. Chewy and soft with a little crisp around the edges. I followed other reviews and put in a full cup of peanut butter.